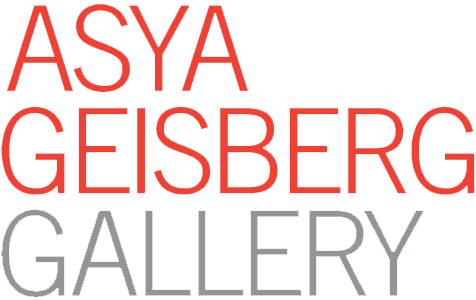 Asya Geisberg Gallery is proud to present “ANTIGRAVITY”, an exhibition of paintings by Ryan Michael Ford. With meticulous detail and highly charged color, the artist’s narratives derive from Surrealism’s necessary allusions to reality and his own idiosyncratic logic. Ford’s characters - surfing aliens, fluffy puppies, bipedal mythical characters like Bigfoot or Yeti - pose in comic and sometimes absurd situations, but always in a recognizable human context. As in the parallel universe of “Westworld”, everything is as we expect with a few subtle but crucial distinctions. 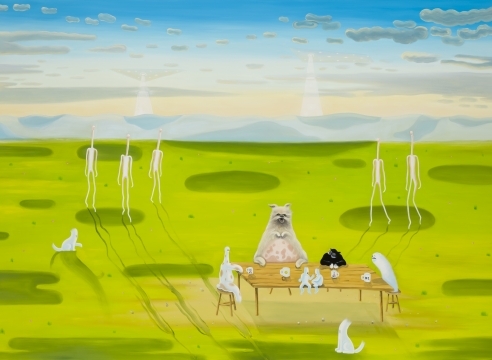 A buoyancy characterizes the works in the exhibition - both in a literal sense, and in a pervasive mood of hilarity, a sweetness underlined by the sugary color palette, and a childlike innocence: everyone gets along, no matter how incongruous the grouping. Dancing dogs blow bubbles, gangly alien creatures pirouette on jet skis, and pups form a pyramid in the sky, as if in a hyperactive cheerleading competition. Ford’s psychedelic landscapes are painted with a comprehensibly “serious” attitude and luscious painterliness, placing them somewhere between Fragonard, Will Cotton, and Lisa Yuskavage. Influenced by artists such as George Condo, Allison Schulnik, Philip Guston, Jim Nutt, Ali Banisadr, David Altmejd, Remedios Varo, Siennese Renaissance painters such as Il Sassetta, as well as The Harry Who and cartoons, Ford carves out a succinctly singular style. While Ford’s work has always embraced playful themes and a confident ridiculousness, the paintings in “ANTIGRAVITY” emerge from a weightlessness of mind. Characters approach the environment and each other with benevolence and wonder, and different life forms relax or play together, engaged in sybaritic activity, seeking the nectar of positivity. The rich colors and paint handling induce a similar state of calm reflection and meditative oneness, with vast open sky blues, electric oranges, glowing yellows, and deep space indigos, pinks, and purples. Although Ford’s paradise can seem unattainable, the magic of his alternate world is meant to mirror the blissful qualities of our own, recognizable through heightened consciousness. 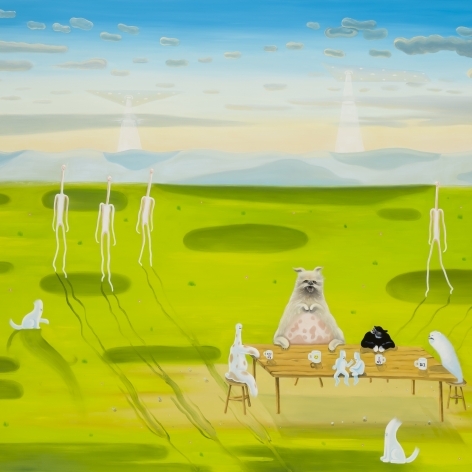 In “Air Biscuit”, several dog-like creatures are seated at a table engaged in conversation and clutching novelty mugs, reminiscent of a staging of the Last Supper. In the background, groups of aliens have descended from their spaceships, ready to share their advanced technology in exchange for the secrets of unconditional love and forgiveness the dogs possess. The enigmatic narrative may appear opaque but we can see in Ford’s work a fertile imagination with a distinctive purpose, proposing a serene nirvana for our reflection.